But for those who were thinking that, the good news is that the Christian Church actually celebrates the Christmas season at a different time to the Santafest holiday that confusingly goes by the same name. We in the Church begin our celebration on the day when everyone else finishes theirs, and so after the Feast of the Nativity, or Christmas day, we have a further eleven days to reflect upon and celebrate what the incarnation of Jesus means, and we are no longer being bombarded by images of reindeer, Santa Claus and shopping day countdowns. This is our time, in one of the quietest times of the year, to think about what it means to us and to our world that Jesus was born as one of us. We can begin to get past the prevalent images that suggest that Christmas is just a birthday celebration for a cute baby, or that it is essentially some kind of celebration of the happy nuclear family. 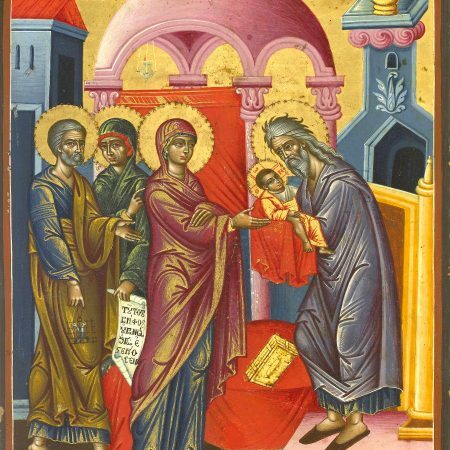 Today’s Gospel reading does in fact portray a nuclear family – presumably a happy one – going through some of the customary rituals that follow the birth of a child. But this portrayal of the socially prescribed family rituals is mainly a backdrop to some more unusual events; namely the encounter with two aged prophets who offer insights into who Jesus really is and into the significance of his arrival on earth. One of them, Simeon, offers up a prayer that has become one of the treasury of biblical songs known as canticles that are a part of the Church’s liturgical heritage. It is often given its Latin name, the Nunc Dimittis, and we will sing it at the conclusion of our worship tonight. People do seem to do that quite literally at times. They seem able to hold on to life beyond expectations, waiting for some great event they’ve been longing for, and then die shortly afterwards. I remember at the church I was at 30 years ago, a dying man lying in a coma for six weeks while his favourite pastor was overseas and then dying within 24 hours of him arriving home. Rather more frivolously, but perhaps just as real for some, you would no doubt have heard many Richmond supporters in the last three months saying that they could die happy now they had seen Richmond win an AFL premiership. St Kilda supporters like me continue to hang on waiting and hoping, just longing to see the Sainters win the flag before we die. Some of the early Christian preachers described Simeon as the last of the Old Testament prophets, because although his story is in the New Testament, what he is bearing witness to in this canticle is the fulfilment of the Old Testament hopes in the advent of the new. We can take Simeon’s words as a reminder that we can’t fully understand the significance of Jesus the Messiah without understanding the ancient Hebrew people’s fervent hopes and expectations for a messiah. The Apostle Paul sums it all up succinctly in the reading we heard from his letter to the Galatians. He uses the concepts of redemption and adoption: “But when the fullness of time had come, God sent his Son, born of a woman, born under the law, in order to redeem those who were under the law, so that we might receive adoption as children.” The language is different to that of Isaiah, but the thrust of the message is the same. Something has to change. A change for the better is needed, big time. And the Messiah comes to usher in that change. And those who see the arrival of the Messiah can die happy. Paul contrasts life either side of the change as “living under the law” and “living as God’s adopted children.” This is a big contrast when we unpack it. It point to two contrasting ways of understanding God; two contrasting ways of seeing what God expects of us and how God relates to us. It says that we have understood God first and foremost as a law enforcer. We have not imagined God as particularly interested in any sort of intimate relationship with us, but just in whether we keep the rules and measure up to some pretty rigorous expectations. This is a harsh God; a demanding God. And when we get it wrong as we inevitably will, this is an angry punishing God. This is a God who inspires about as much love as a parking meter inspector. This is a God who inspires not love, but fear and wariness. But, says Paul, when the time was right, God sent his Son to free us from that very wrong picture of God and let us know what God is really like. God sent his Son, born of a woman (just in case you were thinking he was some kind of disembodied spirit), born under the law (just in case you thought he didn’t experience the tough side of life the way we do), in order to redeem those who were under the law, so that we might receive adoption as children. What Jesus reveals to us is a God who longs to relate to us as a loving parent. Sure parents have some concern for our behaviour and put some rules and guidelines in place, but a loving parent’s pattern of relating is not focussed around those things. In fact, if the relationship is going well, they probably barely even notice some casual breaches of the rules. The rules God has given are perhaps necessary for those who do not seek to relate to God, but what God really wants is not obedient subjects but loving children. What God really wants is for us to come running into God’s arms shouting “Mummy, Daddy!” like joyous uninhibited children. Forget about rules and purity codes and compulsory sacrifices and offerings. Just come and know yourself beloved and cherished, and let down your hair and live. Live! God longs for that; yearns for that; and has gone to great lengths to get that message through to us. And in this Christmas season, we see God coming among us and showing us the way. A God who was primarily a law-enforcer would not place his life in our hands as a tiny baby. But a God who longs for a tender, intimate and loving relationship with us might. And that God has. What richer sign of God’s desire for us could there be. God reaches out in love, searching for a response of mutual love; placing his life in our hands, and calling us to place our life in God’s hands and to rest in God as trustingly as a tiny baby.